In The Detail see: (Film 1) Loughinisland: The Untold Story (Film 2) Interview with Witness `A’ (Film 3) Widow Angry Evidence Was Ignored (Film 4) Relatives Question Pardon For Suspect (Film 5) Survivors Story (Story 2) Loughinisland: Collusion or Myth? One of the families’ key criticisms was a police admission that the getaway car had been destroyed in 1996 – despite being held for safe keeping in an RUC station. In October 2009 the witness, who can only be referred to as `A’, approached a widow of one of those killed in Loughinisland after watching a news report which said police had destroyed the getaway car two years after the attack. She further alleges the officer, who can only be identified as `X’, subsequently passed her personal details on to a relative of the suspect getaway driver. Speaking publicly for the first time `A’ reveals how she had been at home with her family near Loughinisland on June 18, 1994 watching Ireland take on Italy in the World Cup. As `A’s family watched the football match on television a younger family member suddenly fell ill.
As the doctor had never been to `A’s’ home, she put on all the lights in the house and stood at the bottom of the family’s lane waiting for the GP to arrive. ``I immediately thought they were up to no good, as they were driving so fast,’’ she told the Detail. ``The wheels were hardly touching the lane, as the car was bouncing about with the speed it was doing. ``I could see that there was a driver, a front seat passenger and at least two, maybe three in the back seat. ``As the car sped past, the driver looked out and stared at me, and I got a full side and front profile of him. ``He had blonde hair, a light, light pale blonde and his hair was sitting up with like a crew cut. ``His hair was very distinctive. ``I would have recognised his face again no problem. ``He wasn’t fat, it was a normal sized face, he wasn’t a teenager, but he wasn’t an old man either. 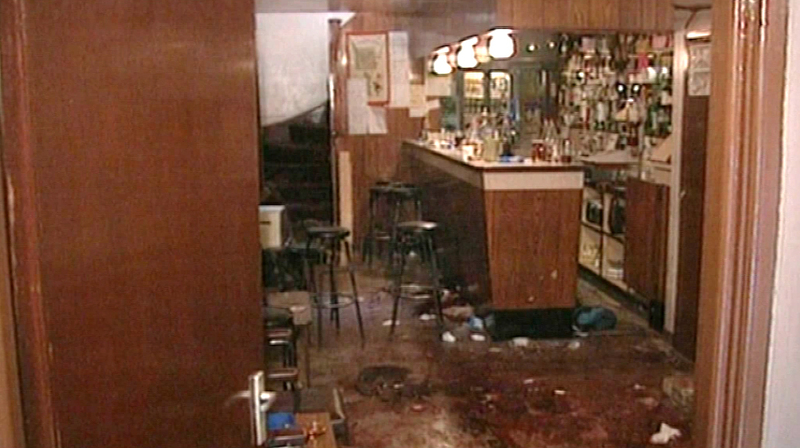 Minutes later `A’ learned of the attack on O’Toole’s Bar. ``I rang my husband and told him there’d been a shooting in the bar and it was definitely O’Toole’s bar. ``He left work and went straight there. ``And the first one that he found out was dead was Frosty (Adrian Rogan). ``He rang me to tell me that Frosty was dead. Up until then it wasn’t really that real. ``It was like a bad dream, it was just, you know, you’re going to wake up and this isn’t really happening. ``But when he told me that Frosty was dead I told him then that I had seen the car going down passed the house and had got a good look at the driver. ``He immediately said: ’phone the police’. ``In those days, you didn’t really bring the police to your house unless you had a really good reason to. ``I knew some of them quite well and just a few months before that I had got to know one of them (Malcolm Jenkinson) that I didn’t know previously, but I just knew to see in the bar. When police arrived at `A’s home she gave detectives a detailed description of the car and the getaway driver. ``I told police that I was willing to co-operate with any court proceedings and they asked me would I be able to identify the driver again and I said yes. ``Police returned to me a couple of times that week, but I was never invited to attend an ID parade or anything, and as time went by I heard nothing more about it. Several years later a relative of `A’ was killed and in the aftermath she became friendly with police officers who had dealt with the case. In particular she became friends with one officer, who can only be identified as `X’. ``He would have kept cars for the police, for storage purposes, abandoned cars, cars involved in accidents, cars used in crimes. ``He had a big yard and garden and garage and would have had room for dozens of cars. ``At times it looked like a scrapyard. ``I was out in his yard one day and was just dandering about, he was standing in the garden having a cup of tea with my husband and I was out having a smoke. ``Out of nosiness, more than anything, I lifted up a tarpaulin on one of the cars and nearly had a heart attack as I immediately recognised the car as a red Triumph Acclaim. ``Knowing his job and what he does with cars for the police I feared that it was the getaway car from Loughinisland. ``I immediately went back to him and said: ``What the f**k are you doing with that red Triumph there, that’s the car the shooters drove from Loughinisland! ``He was aware that I had seen the getaway car as I’d told him the story. ``I wasn’t aware of a green Rover ever before. ``I couldn’t believe what I was hearing. ``He said to me not to be saying to anybody that the cars were there. ``I agreed not to, but have to say that I was perturbed to see the car again. ``I would have been at his house plenty of times since, and the car was always still sitting there. In July 2008 `A’ says she received a phone call asking if she would be available to take part in an ID parade. While `A’ had been made aware of the suspect’s name, she had never met him. ``I was previously aware of a rumour, that the driver was a person called -—. ``Apparently he would often get drunk and boast about his role. ``He would boast that he could do anything and get away with anything. ``As he was telling me this I couldn’t believe my ears,’’ she said. ``(He) later told me that the police officer had given him my details. `A’ said she became convinced the killers were being protected from prosecution after another sinister development. At that time ombudsman investigators showed `A’ copies of witness statements she had made to the original murder investigation in June 1994, but no mention of the getaway car or the description of the driver had been included. The ombudsman is understood to have been asked to investigate why `A’s description of the getaway driver and killers’ car was not included in her original statement. However, `A’ says she now lives in constant fear that her life is in real danger. ``They told me that I had to be very careful; they said the alleged person had a history of violence and was a dangerous person and that I needed to be very careful and needed not to keep a daily routine, but to vary my routine. ``They actually sent someone out to the house to explain to me how to keep myself safe when I was out and about, when I would be driving or if someone, like if someone on a motorbike pulled up close to the car to drive off, even if I was sitting at traffic lights, if I felt in any way in danger. ``It frightened the life out of me. ``I didn’t realise that me coming forward and telling that I knew where the car was going to end up like this, that it would be dangerous for me and my family. ``I didn’t know that at the time. I know that now. `` I can’t go out any more. I’m very careful where I go. ``I’m always looking over my shoulder. ``It makes me angry that I went to all this bother and I told the absolute truth. ``The car had been sitting there for years. ``I saw it with my own two eyes. I touched the car. ``The policeman admitted to me that it was the car and that he in fact had the other car there. ``The policeman has been arrested and investigated and I have been told by the ombudsman’s office that he’s not being prosecuted by the PPS. ``There had to be police collusion, otherwise why did no police ever come back to me afterwards, you know, after the funerals, when things had died down a bit. ``Why did they not come back then and say: `right, we want to go back over your statement. We want to know exactly what, you know. ``They never done anything like that. ``No one ever said boo to me after it, for all these years. ``Only I saw that television programme and realised that I knew where the car was, if I had missed that programme that night I wouldn’t have known that the car was supposed to have been destroyed. ``I have had tragedy in my life that actually stopped me buying newspapers. ``I don’t particularly want to read about murders and deaths and violence anymore because of the tragedy in my life. ``I know exactly how the Loughinisland families feel. ``I know how everyone of them feels.